Name Variation Fred L. Pulvermacher was also known as Frederick. Fred L. Pulvermacher was born on 22 September 1929 at Wisconsin. He was the son of Mathew Pulvermacher and Anna Bindl. Fred L. Pulvermacher died on 3 November 2002 at age 73. Fred L. Pulvermacher obtained US Social Security Card at Wisconsin; last residence Deerfield, Dane, Wisconsin. [S250] U.S. Federal Census 1930 U.S. Federal Census, by Ancestry.com, ED8. Dwelling 129. Married Name 28 October 1931 As of 28 October 1931,her married name was Huebsch. Amelia Barbara Pulvermacher was born on 29 April 1910 at Plain, Sauk, Wisconsin, twin with Agnes. She was the daughter of Mathew Pulvermacher and Anna Bindl. Amelia Barbara Pulvermacher married Francis E. Huebsch, son of Frank John Huebsch and Myrtle Davison, on 28 October 1931. Amelia Barbara Pulvermacher died on 23 July 1985 at Wisconsin at age 75. [S243] U.S. Federal Census 1920 U.S. Federal Census, by Ancestry.com, ED160. Dwelling 143. Michael Pulvermacher was born on 2 December 1847 at Wisconsin. He was the son of Johann Pulvermacher and Anna Marie Lanser. Michael Pulvermacher married Agnes Neuheisel, daughter of Johann Adam George Neuheisel and Theresa Emser, on 30 March 1868. Michael Pulvermacher died on 18 January 1922 at age 74. He was buried after 18 January 1922 at Old St Lukes Cemetery, Franklin, Sauk, Wisconsin. [S247] U.S. Federal Census 1870 U.S. Federal Census, by Ancestry.com, Page 30. Dwelling 207. 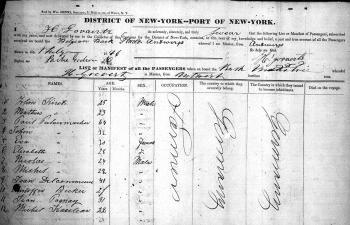 [S246] U.S. Federal Census 1880 U.S. Federal Census, by Ancestry.com, NA Film Number T9-1446 Page Number 48B. [S245] U.S. Federal Census 1900 U.S. Federal Census, by Ancestry.com, ED129. Dwelling 38. [S364] Wisconsin State Census Wisconsin State Censuses, 1895 and 1905, by Ancestry.com, Dwelling 38. Name Variation Agnes Neuheisel was also known as Aggie. Married Name 30 March 1868 As of 30 March 1868,her married name was Pulvermacher. Agnes Neuheisel was born in December 1847 at Wisconsin also reported as Dec 1848. She was the daughter of Johann Adam George Neuheisel and Theresa Emser. 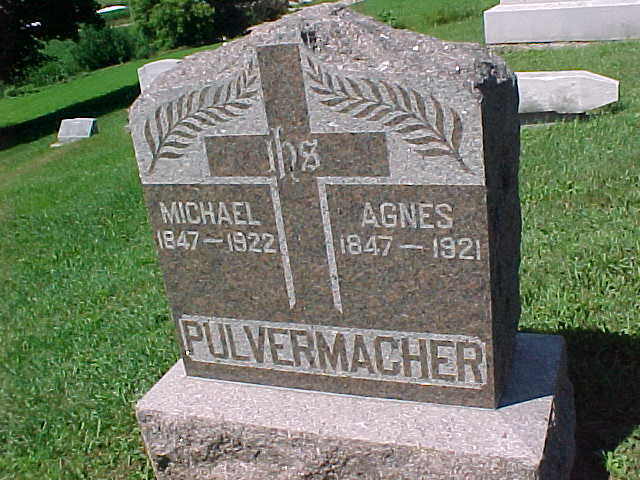 Agnes Neuheisel married Michael Pulvermacher, son of Johann Pulvermacher and Anna Marie Lanser, on 30 March 1868. Agnes Neuheisel was buried in 1921 at Old St Lukes Cemetery, Franklin, Sauk, Wisconsin. Agnes Neuheisel had 12 with 7 living in 1900 children. [S246] U.S. Federal Census 1880 U.S. Federal Census, by Ancestry.com, Dwelling 1226. Married Name 16 September 1890 As of 16 September 1890,her married name was Meister. Barbara Pulvermacher was born on 11 December 1869 at Wisconsin. She was the daughter of Michael Pulvermacher and Agnes Neuheisel. Barbara Pulvermacher married Peter Meister, son of Martin Meister Sr. and Walburga Zimmerman, on 16 September 1890 at Sauk, Wisconsin. Barbara Pulvermacher died on 28 December 1946 at Sauk, Wisconsin, at age 77. Name Variation Theresia Pulvermacher was also known as Theressa. Name Variation Theresia Pulvermacher was also known as Theresa. Married Name 8 February 1899 As of 8 February 1899,her married name was Kaul. Theresia Pulvermacher was born on 12 September 1873 at Wisconsin. Theresia Pulvermacher married Peter Kaul Sr., son of Cassimer Kaul and Anna Mary Moll, on 8 February 1899. Theresia Pulvermacher died in 1956. Theresia Pulvermacher had 1 with 1 living in 1900 children. She had 6 with 6 living in May 1910 children. Children of Theresia Pulvermacher and Peter Kaul Sr.
Name Variation Francis Pulvermacher was also known as Frances. Francis Pulvermacher was born in February 1877 at Wisconsin. Name Variation Johann Pulvermacher was also known as Johan. Johann Pulvermacher was born on 13 October 1814 at Germany. He was the son of Paul Pulvermacher and Maria Kirst. Johann Pulvermacher married Anna Marie Lanser on 3 November 1846. Johann Pulvermacher died on 3 March 1876 at age 61. Mathias Pulvermacher was born circa 1852 at Wisconsin. Name Variation Anna Marie Lanser was also known as Mary. Name Variation Anna Marie Lanser was also known as Marie. Married Name 3 November 1846 As of 3 November 1846,her married name was Pulvermacher. Anna Marie Lanser was born on 19 August 1824 at Germany. She married Johann Pulvermacher, son of Paul Pulvermacher and Maria Kirst, on 3 November 1846. Anna Marie Lanser was born on 20 January 1900. Marie C. Pulvermacher was born circa 1856 at Wisconsin. She was the daughter of Johann Pulvermacher and Anna Marie Lanser. Name Variation Mathias Joseph Pulvermacher was also known as Joseph. Mathias Joseph Pulvermacher was born circa 1858 at Wisconsin. Margaret Pulvermacher was born circa 1863 at Wisconsin. Adam Pulvermacher was born in May 1866 at Wisconsin. Adam Pulvermacher married Emma (?) circa 1892. Hubert Pulvermacher was born circa 1868 at Wisconsin. Paul Pulvermacher married Maria Kirst. Paul Pulvermacher was born on 24 August 1781 at Germany. Married Name Her married name was Pulvermacher. Maria Kirst married Paul Pulvermacher. Maria Kirst was born circa 1780 at Germany. She died on 17 March 1825. Married Name 4 November 1940 As of 4 November 1940,her married name was Pulvermacher. Irene Elsie Curless was born on 18 March 1920. She was the daughter of Clarence Curless and Flossie Leora Dieter. Irene Elsie Curless married Matthew Alfred Pulvermacher, son of Mathew Pulvermacher and Anna Bindl, on 4 November 1940. Irene Elsie Curless died on 13 June 1991 at age 71. Name Variation Katherine Phelan was also known as Katie. Katherine Phelan was born circa 1844 at Ireland. She was the daughter of John Phelan and Catherine Slevin. [S248] U.S. Federal Census 1860 U.S. Federal Census, by Ancestry.com, Page 145. Dwelling 1101. Bridget Phelan was born circa 1854 at Wisconsin. Name Variation Emily Voelkel was also known as Emilia Zitonia. Married Name before 1876 As of before 1876,her married name was Nachreiner. Emily Voelkel was born on 25 June 1854 at Wisconsin. She married John Baptist Nachreiner, son of Michael Nachreiner and Franciska Frank, before 1876. Emily Voelkel died on 12 July 1895 at age 41. Walter Nachreiner was born on 3 July 1895. He was the son of John Baptist Nachreiner and Emily Voelkel. Walter Nachreiner died on 4 September 1895. Name Variation Franz Frank was also known as Frank. Franz Frank was born circa 1853 at Bavaria, Germany. He was the son of Franz Frank and Anna Nachreiner. Franz Frank immigrated with Franz Frank and Anna Nachreiner in 1863. [S247] U.S. Federal Census 1870 U.S. Federal Census, by Ancestry.com, Year: 1870; Census Place: Franklin, Sauk, Wisconsin; Roll: M593_1739; Page: 82A; Image: 169; Family History Library Film: 553238. Rosa Frank was born circa 1862 at Bavaria, Germany. She was the daughter of Franz Frank and Anna Nachreiner. Rosa Frank immigrated with Franz Frank and Anna Nachreiner in 1863. Maria Frank was born circa 1864 at Wisconsin. Josephina Frank was born circa 1867 at Wisconsin. Name Variation Anna Zangl was also known as Zangle. Anna Zangl was born circa 1867 at Bavaria, Germany, also reported as Wisconsin. She was the daughter of Michael Zangl and Katharina Lins. Anna Zangl was adopted after 1876. [S247] U.S. Federal Census 1870 U.S. Federal Census, by Ancestry.com, Year: 1870; Census Place: Bear Creek, Sauk, Wisconsin; Roll: M593_1739; Page: 37B; Image: 78; Family History Library Film: 553238. Married Name Her married name was Frank. Anne (?) married Otto Frank, son of Joseph Frank and Mary Soeldner. Anne (?) was born in 1891. Margret Frank died in 1932. She was the daughter of Otto Frank and Anne (? ).